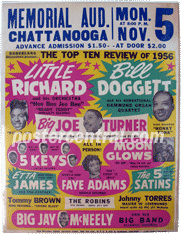 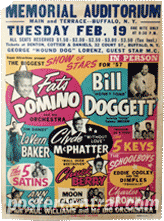 I will pay top dollar for original various-artists 1950s concert posters like these: The Top Ten Review of 1956 in Chattanooga, TN, Nov. 5, 1956; Super Attractions Present The Biggest Show of Stars for ’57 (Spring Edition) in Buffalo, NY, Feb. 19, 1957; Danceland Attractions Presents “Fantabulous” Rock ’N Roll Show of ’57 in Bluefield, WV, June 30, 1957; Super Attractions Present The Biggest Show of Stars for ’57 (Fall Edition) in Sacramento, CA, Oct. 18, 1957; Alan Freed Presents The Big Beat in Madison, WI, April 23, 1958; and Super Enterprises, Inc. 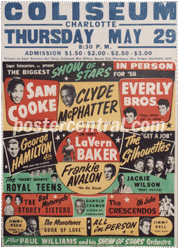 Present The Biggest Show of Stars for ’58 (Spring Edition) in Charlotte, NC, May 29, 1958. 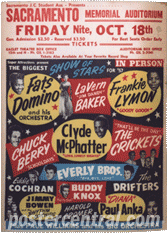 These six great examples of multi-act 1950s concert posters are all original, all printed before the event for the sole purpose of selling tickets. 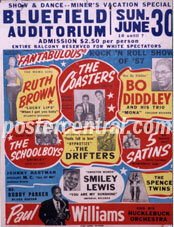 They feature artists like Chuck Berry, Buddy Holly, Buddy Holly and the Crickets, Little Richard, Fats Domino, The Everly Brothers, Bo Diddley, Sam Cooke, Jerry Lee Lewis, Jackie Wilson, Frankie Lymon, The Coasters, Ruth Brown, The Drifters, LaVern Baker, The Moonglows, Eddie Cochran, Big Joe Turner, Charles Brown and a host of others. 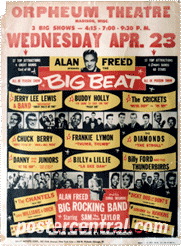 The unsung MCs and bandleaders include Paul Williams and his Big Orchestra, Harold Cromer, Alan Freed and his Coral Records Big Rocking Band, Paul Williams and his Show of Stars Orchestra, Sam “The Man” Taylor, Big Jay McNeely and his Big Band, Johnny Torres, and Paul Williams and his Hucklebuck Orchestra.